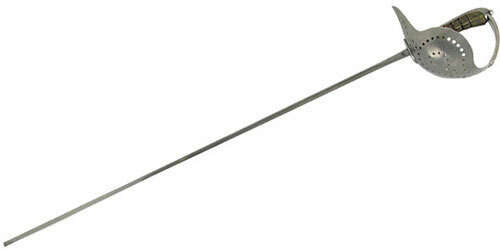 Pecoraro Fencing Swords for sale are 40 ¼ inches in all. These fencing swords are designed like real 19th century Italian dueling sabres that were used for military training by Salvatore Pecoraro. This modern version features a wire-wrapped 5 ¾ inch sharkskin pattern handle. The functional 34 inch flex tempered, high carbon steel blade has a button tip making it suitable for stage combat and sparring. They have a full-cupped perforated guard, ridged for reinforcement at the thinner pommel end of the D. They feature a stainless steel guard and weigh 1 lb 5 ounces. 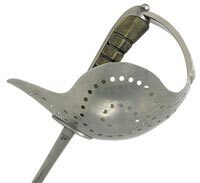 Buy the Pecoraro Fencing Swords for $189.99.